Have your family's picture taken with Trevor, Joplin's most famous rabbit in time for Easter 2019. The cost is $20 per session with award winning photographer Russ Kinerson. Proceeds benefit Wildcat Glades Friends Group, a 501 (c) 3 not for profit organization whose mission is to protect the area known as Wildcat Park & the surrounding chert glade environment, habitat & wildlife by promoting awareness and sustainability, providing education, & recreation space & programs & sponsoring nature-based activities. You will receive a jump drive with your photos the day of your session. A photographer's release will be on each jump drive. Printing of photos is your responsiblity. 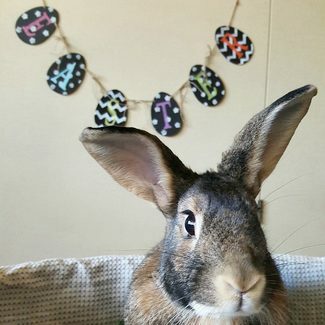 Bunny related crafts will be available to keep your little ones occupied while they wait to sneak a cuddle with Trevor during their photo shoot. Please list the number of people in your photo session. Multiple family pictures and combinations can be photographed.